NEW BRITAIN – The first part of the city’s Stanley Loop Trail is officially open for business. City officials, members of Bike New Britain and Friends of A.W. Stanley Park cut the ribbon on the first phase of the Stanley Loop Trail on Friday. The phase was completed Sept. 5. 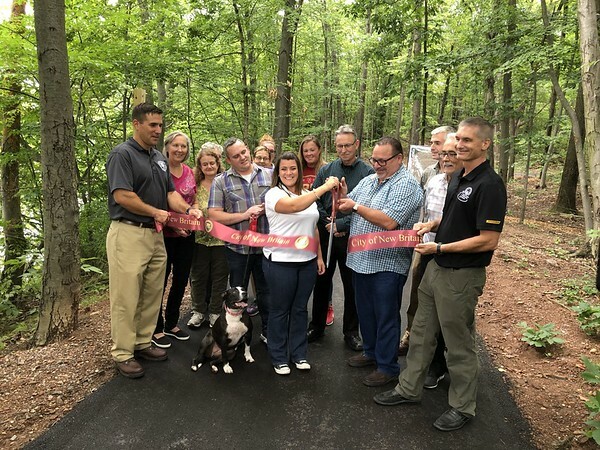 Tobacco & Sons, the city’s contractor, paved a 10-foot wide bituminous path over a portion of an existing multi-use trail loop that’s located on the eastern side of the 92.7-acre A.W. Stanley Park near Lower Pond. The 1.25 mile paved multi-use trail offers a new area in the park for walkers, runners and cyclists to explore. A 200-foot-long “connector trail” was also added to connect Village Square Road to the park. “There’s a lot of great things going on in our parks, and this is just a sample,” said Erik Barbieri, Director of the Parks, Recreation, and Community Services Department. Barbieri thanked the Friends of A.W. Stanley Park in their continued support of the park. Public Works Director Mark Moriarty said the city was fortunate to get a recreational trails grant it received from the Department of Energy and Environmental Protection. Both phase 1 and phase 2 of the project are being funded by a $3 million grant from DEEP. “The Friends of A.W. had a nature trail back here, I felt like it was a nice asset to the park,” Moriarty said, adding that more people can enjoy it now that it is paved and connected. The entire trail, which will run through Stanley Park and Stanley Quarter Park, is expected to be completed within the next two years. According to the city, future work will include bridging a connection to the western portion of the 124-acre A.W. Stanley Park and eventually to 138-acre Stanley Quarter Park, where a paved multi-use trail will also be added. This would allow riders to access bike lanes on Eddy Glover Boulevard and connect to other parts of the City, which has more than 30 miles of bike lanes and shared lanes. “You don’t see trails like this in too many urban areas across the state, so it’s a gem for us,” Mayor Erin Stewart said. Posted in New Britain Herald, General News on Friday, 14 September 2018 18:15. Updated: Friday, 14 September 2018 18:18.